You can’t catch an international field hockey game these days without seeing a STX hockey stick or two. While the Hammer is definitely up there with the ultimate elite field hockey sticks, the Stallion range is awesome for the good club player. Forgiveness is the word I would use to describe the STX Stallion 300 field hockey stick in my review. What is the difference between a good club players needs for a hockey stick and that of an elite player, forgiveness. The giant North American field sports specialist has given us that with the STX Stallion 300. It’s material composition is the most obvious, 45% carbon fibre, 50% fiberglass topped up with 5% Kevlar makes for a powerful stick with a bit more give than the higher end sticks making it easier to control the ball. With relatively low carbon content you might expect the STX Stallion to be a little cheaper, retail priced at $165 US you might be expecting a little more carbon when comparing to other field hockey sticks at the same price. For me the fascination with getting bags of carbon for your buck doesn’t necessarily ring true as a deciding factor. OK if you are prepared to pay $300-$400 US for a field hockey stick then the STX Stallion 300 is probably going to get ruled out. If however you know where your skills lie and like me find the high carbon sticks just to stiff you might actually want to pay to get a less high carbon content stick like the Stallion 300. 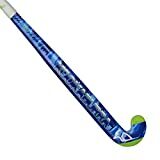 So if you are going to take a hockey stick with a lower carbon fibre content in the composition why not choose one with other cool playability features, like those of the STX Stallion 300. For example we were discussing forgiveness, the shaft is one thing and what about the head. This is what controls the ball and the STX Stallion 300 features the STX Midi head which is slightly thinner and when running with the ball allows a little more control than bigger heads. Obviously you need to be more accurate when hitting but the STX Stallion 300 also features a really wide sweet spot to allow some give. Designed really for the play making midfield player at club level the STX Stallion 300 is not really out there to be a superpower. What I notice that I love about the STX Stallion 300 and all the brands sticks to be honest, is the shape down the shaft. There is a distinct growth in thickness in the shaft shortly after the handle. I can’t say this actually gives power but it feels sturdy towards the hitting and receiving end of the stick without being too bulky in your hands. The STX Stallion 300 is light too, giving you even more control for dribbling and channel type defending when you need to switch the stick from side to side to force your opponent around you. At just 565 grams for a 36.5” hockey stick (+/- 10g per inch) the STX Stallion 300 is down there with the lightest sticks I’ve reviewed so far. It is worth noting that on the STX Stallion 300 you only get the conventional grip, not the Karakal grip which that you find in the higher end models. It’s still a nice grip but nothing special if grip texture is something you look for in a field hockey stick. Bow shape is really inline with the rest of this stick, forgiving. Just 20cm curved nicely positioned in the middle of the shaft, you won’t be the drag flick specialist on the team. However you won’t be popping the ball up every time you pass and giving away dangerous play penalties either! The only thing I can really add now to help you is to comment on the design. I love the graphite grey in the STX sticks, it looks so, well, solid. Combined with the thickening shaft it makes the STX Stallion look really wide. Featuring the yellow writing and silver & white section at the top you can carry a STX Stallion 300 out on to the hockey field with pride. If you are in the market for a hockey stick that is going to fit right in with your existing style of play then if the criteria in the review resonates with you the STX Stallion 300 is a great choice. All STX field hockey sticks are built well, last for a good period of time and are designed with the hockey player in mind. You can’t go far wrong choosing this stick and with the range of lengths available in the US you will be able to match a stick nicely to your requirement.